In the Wordimals Creator Update, YOU are the designer! Creating levels is super fast and incredibly easy. Your levels appear instantly in the actual game, accessible to players all over the world. 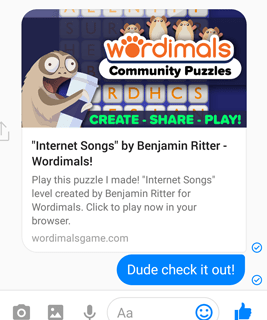 You can even share your creations with your friends, even if they've never installed Wordimals. 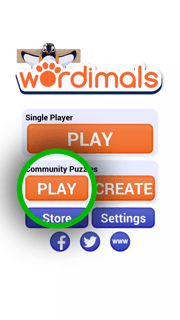 When you open Wordimals, you will see two new buttons under the "Community Puzzles" header. To begin, tap the "Create" button. 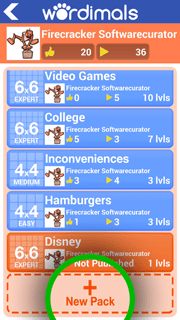 Tap the "New Pack" button and give it a name and difficulty rating. When you add a level to your new pack, you will be asked to provide a "level hint." 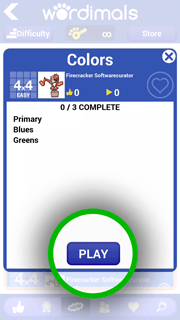 In the above example, our pack is called "Colors" and the hint for this first level is "Primary." 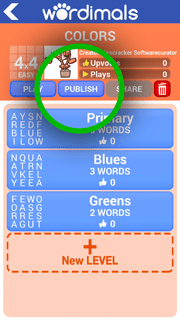 The hint is both the name of the level as well as an important clue for your player about what words the level contains. Now you can add words to your puzzle. It's very simple: Type in the word, then drag your finger on the board to place it. Words that have been correctly placed on the board turn blue. 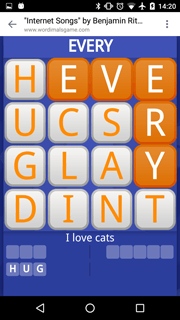 Once all the words are blue, you can tap the "Fill" button to fill in the blank spaces with random letters. When you're done, tap "Save." Once you have at least 3 levels in your level pack, you can publish. 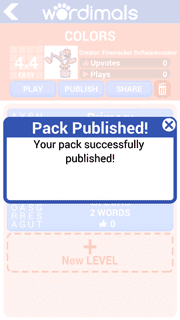 A published pack is immediately playable in the Community Puzzles list and can be shared. You might also find your puzzle hand-picked by our game designers as a Staff Pick, where it will enjoy a special place in the puzzle list for all to see! All around the world, players are creating new puzzles for you to play. 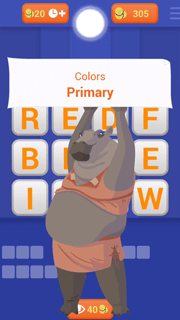 In the Community Puzzles section you can view the most popular packs, sort and filter for recency and difficulty, or search for a specific title. 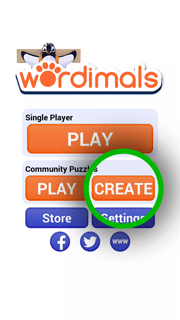 If your friends are playing Wordimals, there's also a special section that shows only what your friends have made. Above, you can see our brand new "Colors" pack in the Newest Packs section. 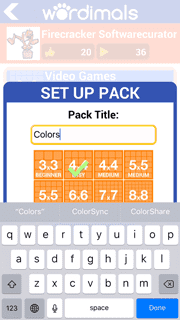 Tapping it brings up the pack details where you can view your progress, set the pack as one of your favorites, or play the pack in Wordimals. As you're playing, be sure to hit the like button on puzzles you found enjoyable. Packs with a lot of likes get promoted higher in the Popular Packs list where more players can find it. Of course, you can also report levels if they have misspellings or bad words. The Wordimals community relies on your reports to keep the game clean and free of troublemakers. Likewise, please don't make us ban you for publishing packs that would be considered offensive. You can also share your levels with people online - even if they've never installed Wordimals before! 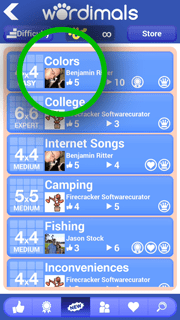 The sharing feature allows you to post a link to your level right here on this website, instantly playable on your mobile or desktop web browser. 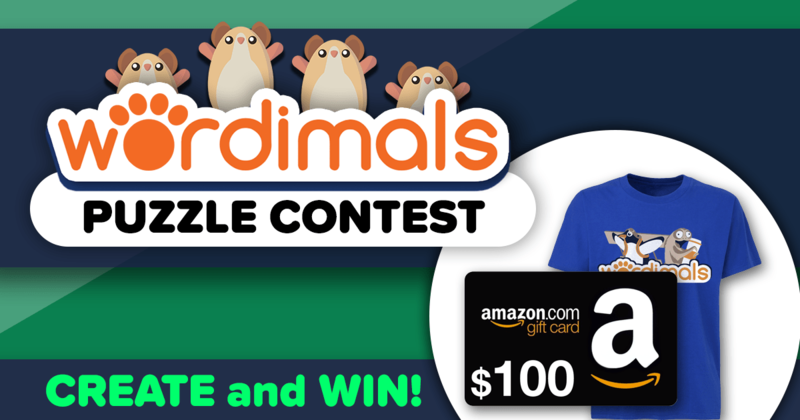 The Wordimals Creator Update is the most exciting thing to happen to word games in a long time! You're now ready to download the game and get started. Have fun!